The diving at the Brothers and the southern islands, like Elphinstone, is excellent. On this page we list diving operators visiting these sites - either by liveaboard or, for Elphinstone, day trips from Marsa Alam. Transfers are usually arranged from Marsa Alam or Hurghada. For flight price comparisons see Kelkoo. For hotels see our accommodation page. For other areas see Dive Operators in Sharm El-Sheikh, Dive Operators in Hurghada, Dive Operators in Dahab, Dive Operators in Saudi Arabia, Dive Operators in Jordan, Diving Sudan or Further Reading. Emperor Divers operate out of Sharm El-Sheikh, Hurghada, Marsa Alam, Nuweiba, Soma Bay, Dahab and Sudan. They have agents around the world. Run by the Red Sea Diving Safari. Shore diving and day trips to Elphinstone.
" Red Sea Diving Safari,whom we were diving with was run by locals & although our dive guide was excellent, in one week our group alone suffered four near misses with propellers of Zodiac inflatable boat engine. Last year we went through Emperor divers, these are a far more professional organisation whom I would not hesitate to recommend. " " My wife and I dived with Pioneer Divers in Marsa Alam. They are very friendly whilst remaining professional. We dived every day at Elphinstone and had fantastic sitings of Hammerhead sharks. Small schools of Hammerheads were spotted on most early morning dives with some schools being 20+. If you are looking for sharks then go to Marsa Alam it's only 5 hrs from the UK. Best time to see Hammerhead sharks in June to Sept "
Their southern charters embark each Friday from Wadi Lahami, run from mid-February to December and access the most southerly reefs and islands of the Egyptian Red Sea. Located at Tulip Hotel about 50 km north of Marsa Alam and 10 minutes from Marsa Alam International Airport. Multinational team specialise in biology and research. Diving center operating for 10 years. English spoken. 45 minutes drive from Hurghada International airport. Reefs unspoiled in Safaga bay (no wind in the bay). From easy dives to drop-off for certified divers (like the very well known Abu Kefan & Panorama reefs) . International courses Padi, SSI, TDI, CMAS. Very friendly and peaceful divesites. Not overcrowded. They will organise hotel reservations, transportation and other travel assistance They also offer guided land tours throughout Egypt, Nile river cruises and desert safaris. Their liveaboards visit north, south, Brothers Islands, deep south and off-shore islands. The office is in downtown Hurghada - directly across from the main Post Office. Diving safari programs in the North (Thistlegorm, Ras Mohammed...) and South (Brothers Islands, Elphinstone, Zabarged...). Offer hotel reservations, airport transfers and shore excursions to Luxor, Cairo, etc. A British agent offering packages to the Southern Red Sea and elsewhere. Aimed at divers travelling from the USA: on the expensive side and an extremely large boat which is not always an advantage. 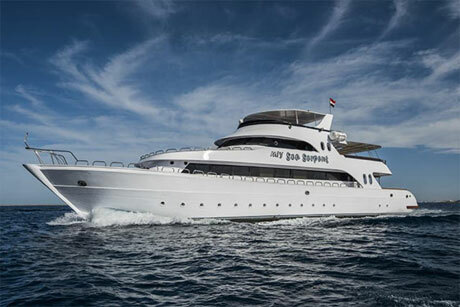 The Sea Serpent Fleet is a "luxury class liveaboard diving operation", providing diving services throughout the Egyptian Red Sea. The fleet comprises M/Y Grand Sea Serpent, M/Y Obsession, M/Y Sea Serpent, M/Y Excellence, M/Y Contessa Mia, M/Y Miss Nouran and M/Y Dreams. They have branches in Egypt, UK, Italy, Switzerland and Belgium. "I would recommend avoiding Diving world. They short changed me 2 days of a liveaboard on a 7 trip! work that out in cash. No one at airport to meet me, less dives than the Germans already on the boat and delivered to the airport late enough to nearly miss flight and sit 15 rows apart. Rubbish!" "Just got back from another Red Sea trip,this year again myself & a group of thirteen,unlucky for some,went to Marsa Alam.the company we went with this year Divers world were very poor indeed,we didn't see the rep all week and in spite of paying for 10 boat dives the dive centre had been instructed that we were to have 5 days diving. We had great difficulty contacting anyone & when we did we were told to pay extra money & to claim it back when we got back to Blighty.....NOT!!. " British travel agent organising diving holidays worldwide. Photographic guide to fish and invertebrates. Note: If you buy any book through one of these links, the SCUBA Travel site earns a commission (at no extra cost to yourself). Thank you for making your purchases from here. Please tells us about your experiences of diving the Red Sea by filling in our diving form. Was the diving good? What about the dive operator or the boat? Let us know. For any other questions or comments fill in the form below.